"Pietro Ottoboni" redirects here. For the cardinal of this name, see Pietro Ottoboni (cardinal). Pope Alexander VIII (22 April 1610 – 1 February 1691), born Pietro Vito Ottoboni, was Pope from 6 October 1689 to his death in 1691. 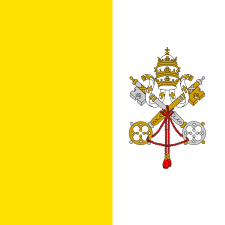 He is the last pope to take the pontifical name of "Alexander" upon his election to the papacy. Pietro Vito Ottoboni was born in 1610 of a noble Venetian family, and was the youngest of nine children of Vittoria Tornielli and Marco Ottoboni, grand chancellor of the Republic of Venice. His early studies were made with marked brilliancy at the University of Padua where, in 1627, he earned a doctorate in canon and civil law. Ottoboni went to Rome during the pontificate of Pope Urban VIII and served as the Referendary of the Apostolic Signatura, and later served as the governor of the cities Terni, Rieti, Citta di Castello and Spoleto. He also served as the auditor of the Sacred Roman Rota. Pope Innocent X appointed him to the cardinalate and in 1652 at the request of the Venetian government and he was made the Cardinal-Priest of San Salvatore in Lauro. He was appointed as Bishop of Brescia in 1654 and later received episcopal consecration in the church of San Marco in Rome. He would spend a quiet decade in his diocese. He opted to be Cardinal-Priest of San Marco in 1660 and resigned as Bishop of Brescia in 1664. Ottoboni also opted to become Cardinal-Priest of Santa Maria in Trastevere in 1677 and later as Cardinal-Priest of Santa Prassede in 1680. He later became the Cardinal-Bishop of Sabina in 1681 and then to Frascati in 1683. His last swap was that of Porto e Santa Rufina in 1687. 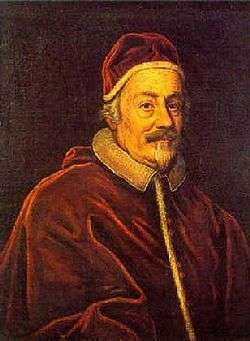 Ottoboni was also the Vice-Dean of the College of Cardinals from 1687 to his pontifical election. Pope Alexander VIII depicted on a gold quadruple Italian scudo from 1689. Saints Peter and Paul on the reverse. Engraved by Antonio Travani, a goldsmith and medalist in Rome. The ambassador of King Louis XIV of France (1643–1715) succeeded in procuring his election on 6 October 1689, as the successor to Pope Innocent XI (1676–89); nevertheless, after months of negotiation Alexander VIII finally condemned the declaration made in 1682 by the French clergy concerning the liberties of the Gallican church. 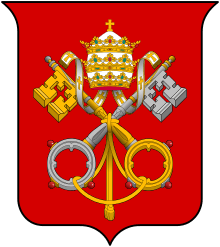 He chose the pontifical name of "Alexander VIII" in gratitude to Cardinal Flavio Chigi, the nephew of Pope Alexander VII, who also had helped support his candidacy. Ottoboni was crowned as pontiff on 16 October 1689 by the protodeacon Cardinal Francesco Maidalchini and took possession of the Basilica of Saint John Lateran on 28 October 1689. Old but of a strong constitution, Alexander VIII was said to be an able diplomat. During his brief pontificate he managed to destroy most of his predecessor's good work. All the money saved by Innocent XI was spent on enriching the Ottoboni family and to a cardinal he said: "I have no time to lose; for me the day is almost done!" Alexander VIII was almost an octogenarian when elected to the papacy, which lasted only sixteen months, during which time little of importance was done. Louis XIV, whose political situation was now critical, profited by the peaceful dispositions of the new pope, restored Avignon to him, and renounced the long-abused right of asylum for the French Embassy. 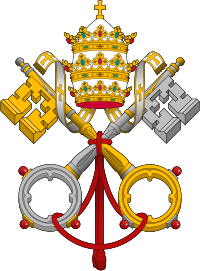 Charities on a large scale and unbounded nepotism exhausted the papal treasury, reversing the policies of his predecessor. Among the various nominations, his 22-year-old grandnephew Pietro was made cardinal and vice-chancellor of the Church, nephew Marco, son of his brother Agostino, was made inspector of naval fortifications and Duke of Fiano, and nephew Antonio, another of Agostino's children, was made general of the church. 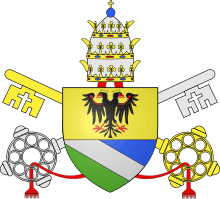 His nephew Giovanni Rubin was made secretary of state and bishop of Vicenza. Out of compassion for the poor of the impoverished Papal States, he sought to help them by reducing taxes. But this same generous nature led him to bestow on his relations the riches they were eager to accumulate; on their behalf, and to the discredit of his pontificate, he revived sinecure offices which had been suppressed by Innocent XI. He bought the books and manuscripts of Queen Christina of Sweden for the Vatican Library. Alexander VIII assisted his native Venice by generous subsidies in the war against the Turks, as well as sending seven galleys and 2,000 infantry for the campaign in Albania. In 1690 he condemned the doctrines of the so-called philosophical sin, taught in the Jesuit schools. He also held three consistories that saw 14 new cardinals elevated. Alexander VIII confirmed the cultus of Kinga of Poland on 11 June 1690 which served as the beatification. On 16 October 1690, he canonized several saints: Ss. Pascal Baylon, Lorenzo Giustiniani, John of Sahagun, John of God and John of Capistrano. Alexander VIII died on 1 February 1691. His grandiose tomb in St. Peter's was commissioned by his grandnephew, Cardinal Pietro Ottoboni, and designed by Count Arrigo di San Martino. The bas-relief at the base and the flanking figures (1704) were sculpted by Angelo de' Rossi, while the bronze statue of the pope was cast by Giuseppe Bertosi. ↑ Forrer, L. (1916). Biographical Dictionary of Medallists. 6. Spink & Son, LTD. p. 129. ↑ Olszewski E. page 13. ↑ "Pope Alexander VIII: Proceedings of the Conclave that led to his election.". Pickle Publishing. 2005. Retrieved 6 February 2015. ↑ Olszewski E. page 5. This article incorporates text from a publication now in the public domain: Chisholm, Hugh, ed. (1911). "Alexander (popes)". Encyclopædia Britannica (11th ed.). Cambridge University Press. This article incorporates text from a publication now in the public domain: Herbermann, Charles, ed. (1913). "Pope Alexander VIII". Catholic Encyclopedia. New York: Robert Appleton. Wikimedia Commons has media related to Alexander VIII. "Pope Alexander VIII". Germania Sacra people index (in German). Göttingen Academy of Sciences and Humanities.